← No Freeway on Gila River! We the Akimel O’odham Youth Collective were a part of this action but were in collaboration with others from the phoenix area. 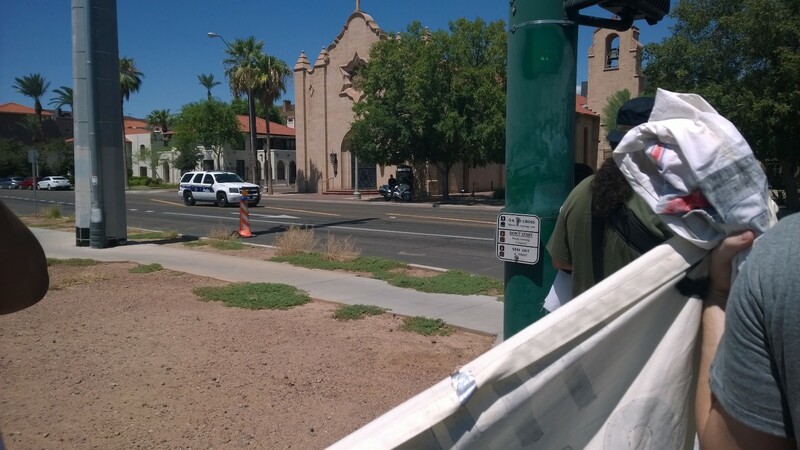 On Wednesday August 27, a group of 20 people from the Gila River Indian Community and Phoenix area gathered to protest the South Mountain Loop 202 freeway proposed by the Arizona Department of Transportation (ADOT), and their decision to open the South Mountain Freeway to Public-Private-Partnership (P3) proposals. A P3 is a business deal between the public sector and a company or companies who take on some combination of design, build, maintain, and finance that makes the project more attainable by allowing the $1.8 billion freeway to be built without ADOT coming up with the funds. The companies benefit from tax-breaks, low-interest loans, and state tax dollars years down the line. 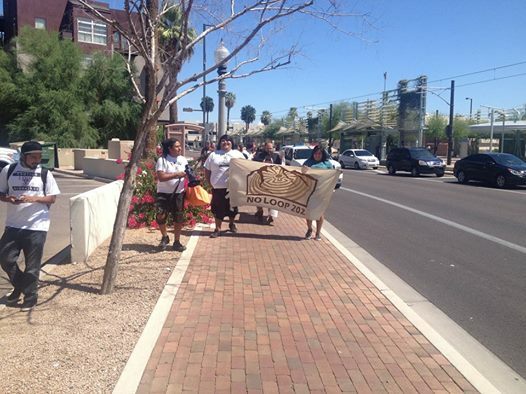 Freeway resistors marched and rallied outside and inside the Maricopa Associations of Governments (MAG) Regional Council and ADOT Priority Planning Committee meetings since both have direct influence in the planning and approval of the freeway project. 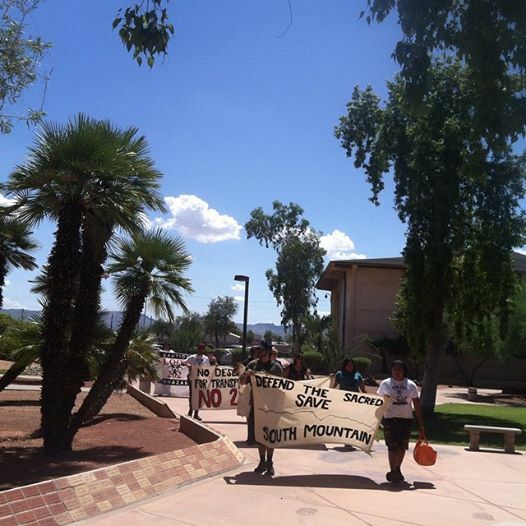 Resistors held banners that read “Defend the Sacred: Save South Mountain” and “Caution Biohazard: Loop 202”. Members from the Akimel O’odham Youth Collective were in attendance and shared the negative health, environmental and cultural implications that the freeway would bring if built. 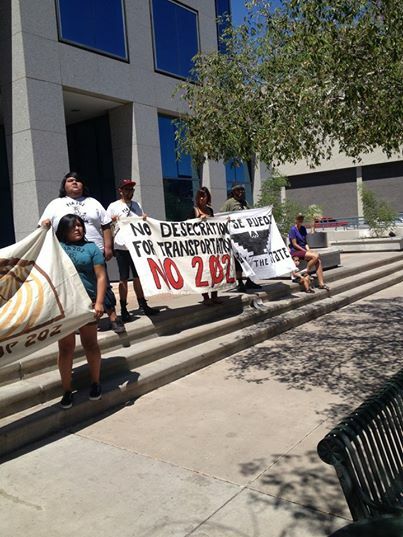 Demonstrators who spoke at the meeting specifically addressed the inherent racism of ADOT’s decision to double down on the construction of the proposed freeway even after Gila River Indian Community members voted for a “no build” option in an official vote. ADOT’s disregard for the objections of Akimel O’odham people from the Gila River Indian Community, and their democratic process, shows that ADOT is committed to lining developers and construction companies’ pockets, not respecting the decision making of the original inhabitants of this region. Two undercover cops were following the group as we left the MAG building. Also three other cops in marked cars were also following us. ADOT’s announcement to open up the South Mountain freeway projects to P3 proposals comes before the expected release of the final environmental draft statement (FEIS) this fall. Today’s demonstration is just one of many that both Gila River Indian Community members and Phoenix area residents have held in opposition to the proposed Loop 202 freeway in that past six years. Multiple speakers stated that if ADOT insists on building the road, freeway resisters will not make it easy for them. “We are here to show you (ADOT) that we’re not going to make it easy. If it takes being a body in the way of a tractor, so be it”. This entry was posted in Uncategorized and tagged ADOT is Racist, AOYC, Arizona, gila river indian community, no build, No Loop 202, No South Mountain Freeway, O'odham, Sacred Sites. Bookmark the permalink.